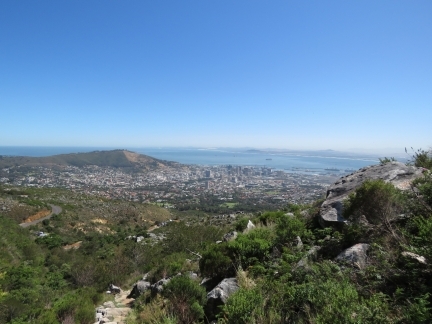 With clear weather forecast for the entire day, we set off on a hike up Table Mountain. The climb up was hot and tiring, but the views along the way and at the top were amazing. There’s our goal in the distance, viewed from the V&A Waterfront. We took a taxi up to the trailhead on Tafelberg Road at 1,260ft above sea level. The view from here already is pretty impressive and we haven’t even gotten started yet. 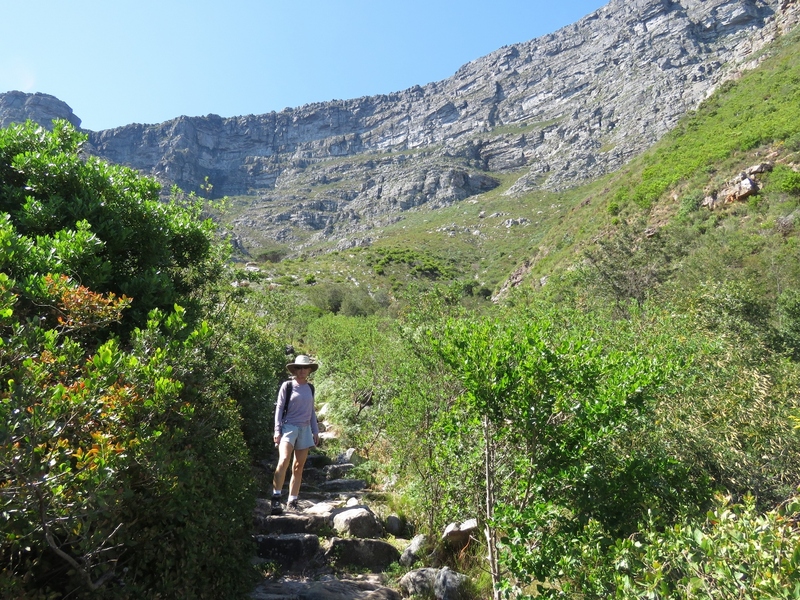 At the start of the Platteklip Gorge Track to the top of Table Mountain. It’s going to be pretty much straight up from here. 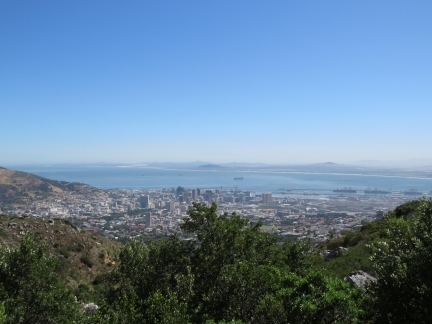 Looking back to Cape Town with Signal Hill on the left. We’re at 1,472ft elevation now. Taking a break at 2,996ft. We’ve climbed 1,736 feet in an hour. 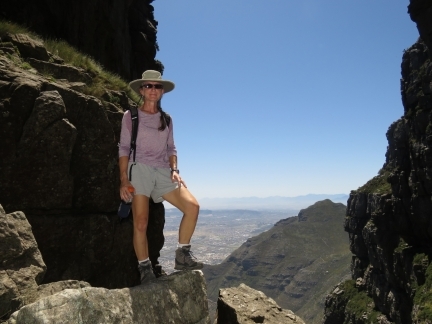 We ascended 2,166ft in 90 minutes to reach the top of Platteklip Gorge at 3,426ft. We were pretty pooped by this point. From the top Platteklip Gorge, we walked the path along the Back Table towards Maclear’s Beacon. This is the sweeping view south with False Bay on the far left, Cape Point and Cape of Good Hope slightly left of center, Hout Bay at center, and the Atlantic ocean coast on the right (click image for a larger view). 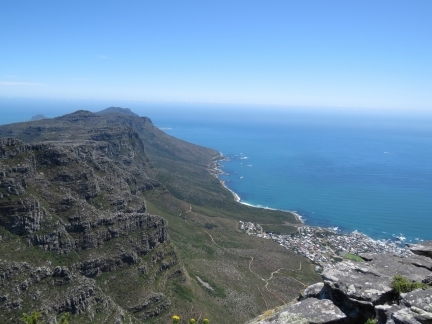 The highest point on Table Mountain is 6,102 ft (1,860m). In 1884, astronomer Thomas Maclear had a beacon built here for his work in measuring the curvature of the earth. 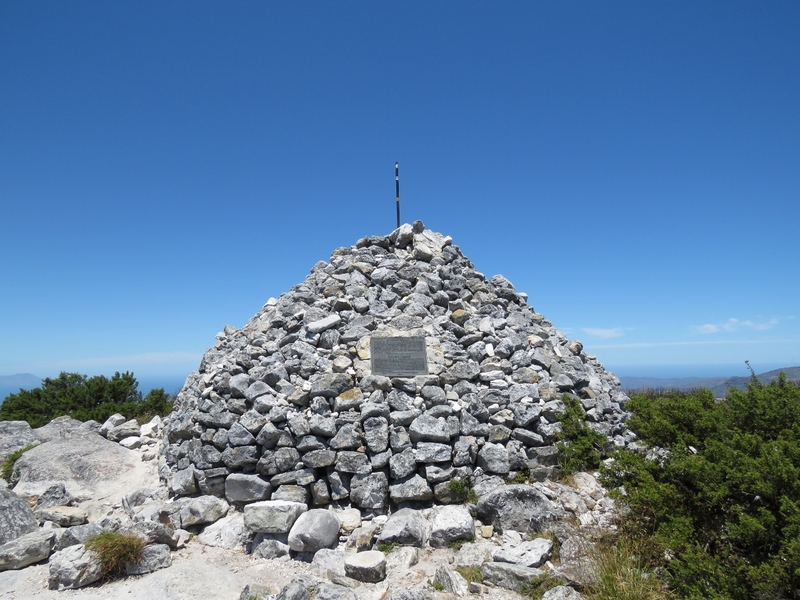 This plaque honours former South African Prime Minister General Jan Smuts, who regularly walked Table Mountain. 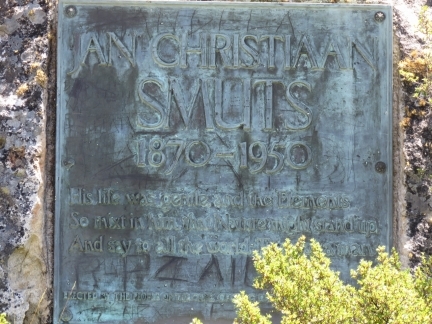 Smuts fought against the British as a commando leader in the Second Boer War, but was a strong British supporter in both World Wars and served in Winston Churchill’s Imperial War Cabinet. He is also the only person to have signed the peace treaties ending both world wars. 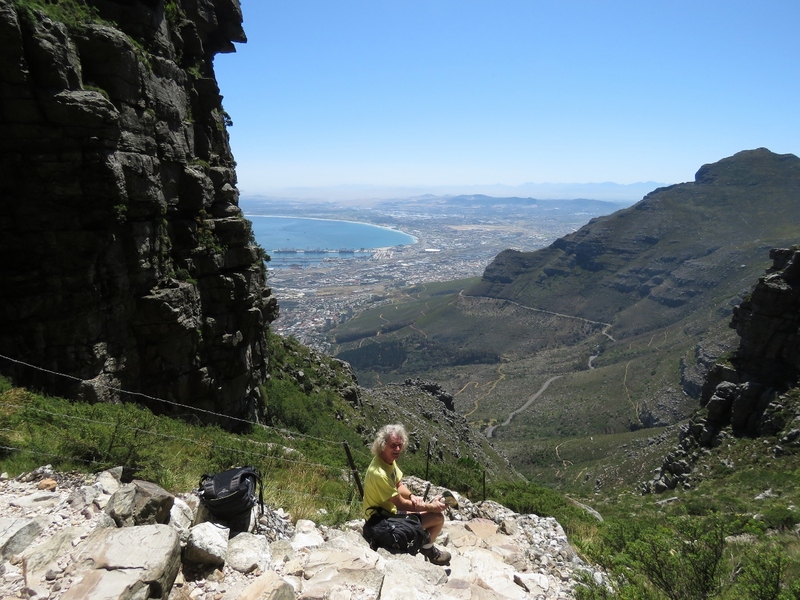 We returned to the top of Platteklip Gorge along the Edge Path, with spectacular views to Cape Town. It really is as straight down as it looks from Jennifer’s perch above the city. The amazing view from the Edge Path. 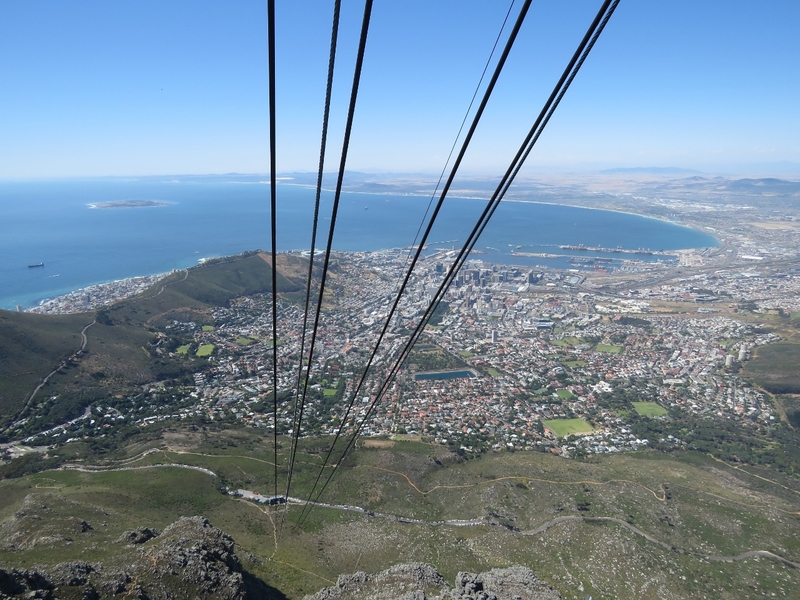 From left to right is the Table Mountain Upper Cableway station, Lion’s Head, Signal Hill, Cape Town Harbour and Table Bay (click image for a larger view). 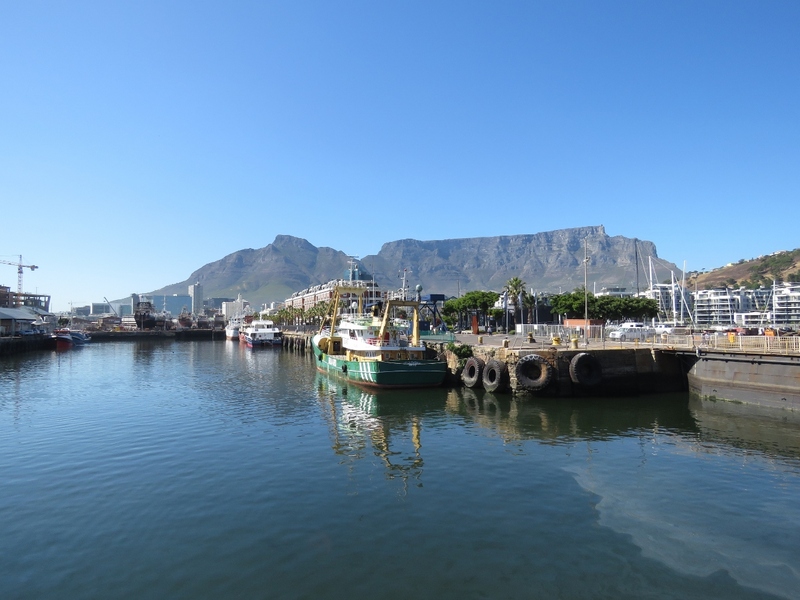 We bought a light lunch from the Table Mountain Cafe and ate on the terrace overlooking the Atlantic Ocean. 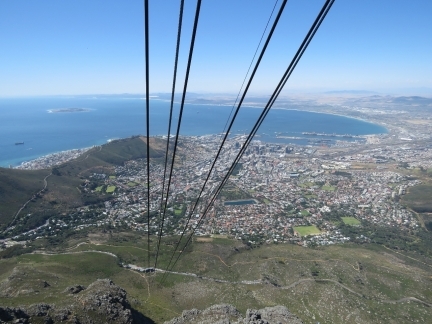 Looking down the steep cableway to the lower station just before we descend back to Tafelberg Road. That is some great vista’s with the Atlantic in the background. 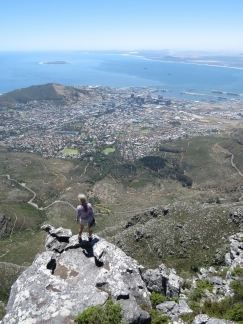 You can’t beat mountains for great exercise neither. I used to runs the ones just west of Ft.Bliss when i was in the army and that helped me achieve a 2 mile run in 8mins 48secs. The photography you both are putting together are really great when it comes to both the boat and locations. 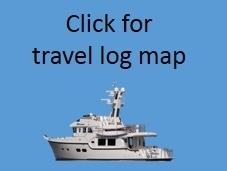 Hope you know many of us following this blog, really do appreciate it. 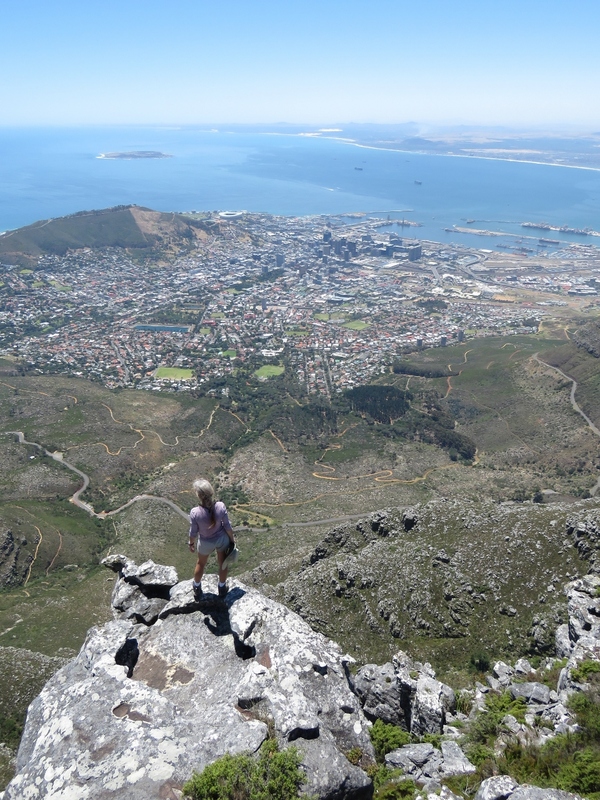 When I got to the top of Table Mountain , it was highly unlikely that I would do 2 miles in 8 mins and 48 secs. I was probalby good for 1/4 mile at that point. :-). Thanks for the feedback on the blog and pictures Tim. Good to hear.